I love fall so so much. Every tiny little thing about it! Of course, I especially look forward to the food… and the eggnog! As I sat there sipping my eggnog-laced coffee the other day, I couldn’t help but think about all the other ways I could possibly enjoy one of my favorite parts of the holiday season. Have I mentioned I have a slight obsession with eggnog? I have been thoroughly enjoying the early eggnog-latte season at all the local coffee shops this year. The day eggnog leaves us for the year is always a sad day in my house! 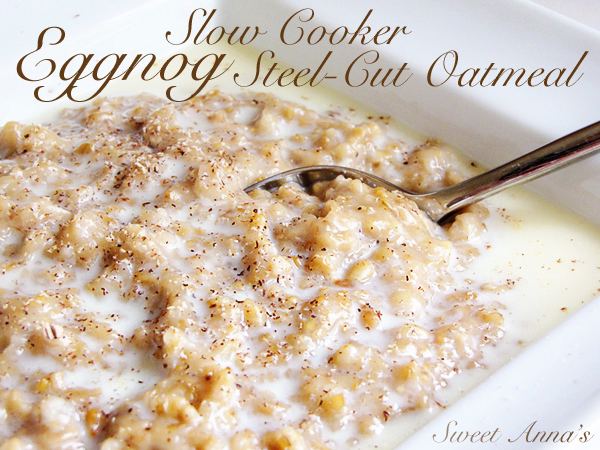 So, naturally, I decided to take my favorite Slow Cooker Steel-Cut Oatmeal recipe and turned it into Eggnog Oatmeal. Oh My Yum!!! What a perfect breakfast! Besides just loving the ease of this recipe (and how great it tastes!) I just can’t help but love how amazing it makes my house smell. If you have never made slow cooker overnight oatmeal before, please do. If only for the amazingness that is waking up to a house smelling of warm, cozy goodness! For about as perfect as a morning can get, I like to set my coffee maker to automatic, throw some oatmeal together in the crockpot and wake up a perfect, no-stress morning. Here’s a tip: This is a perfect way to start off a Monday. We all know Monday’s are difficult, so make prep this oatmeal and let it help start your Monday off on the right foot! Also: Happy Eggnog Season! :o) I hope you enjoy this as much as I do! Mix all ingredients in a slow cooker. Turn on LOW and cook overnight, for about 8 hours. When you are ready to eat, give it a good stir (it will look watery, but it will come together when you stir it!) and serve with more nutmeg on top! If you like your oatmeal thinner, stir in a little more eggnog when you serve it!